Definition : The greatest common factor ( GCF ) of two or more nonzero whole numbers is the largest whole number that is a factor of both or all of the numbers. The GCF of a and b is written as GCF(a,b). There are two ways to find the GCF. For smaller numbers, you can list the factors. 2. For bigger numbers, listing the factors is not the best way. Since you could end up with many factors to put in the list, your list may become too big. 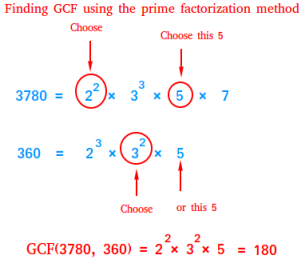 Therefore, for bigger numbers, use prime factorization as illustrated below. 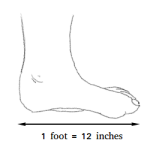 Notice how we pick the factor with the smallest exponent. For the factor 5, since it is the same for both numbers, either one is fine. Notice also that we did not pick 7 since it is not a common factor.